Hey y'all! I sent out a plea for help on social media, asking how to treat my six month old’s pretty severe eczema rash. I was overwhelmed by the helpful responses from the motherhood and childcare community! I thought, I can’t be the only mom who could use this information... So I decided to compile all the suggestions in one easy place. Here are 20+ Simple Treatments for Baby Eczema Rashes! First of all, let me start out by saying it is really hot here in the south. On any given summer day it’s anywhere from 90° to 100°! And we have very high humidity too, so it seems even hotter than that! My babies are already very fair and sensitive skinned. Add that to our excruciatingly hot summer days and it’s a recipe for skin rashes! If my baby is outside for over an hour, I have to keep her fully moisturized and completed covered. Sometimes, she still gets rashes. As in the case where I posted this picture and asked for quick itch relief and healing. After I got the overwhelmingly thoughtful responses, I ended up testing several recommendations I was already leaning towards when I looked up baby eczema relief on WebMD (sorry Dr. Mac!). There were red patches around her eyes too (but they’re hard to see here). 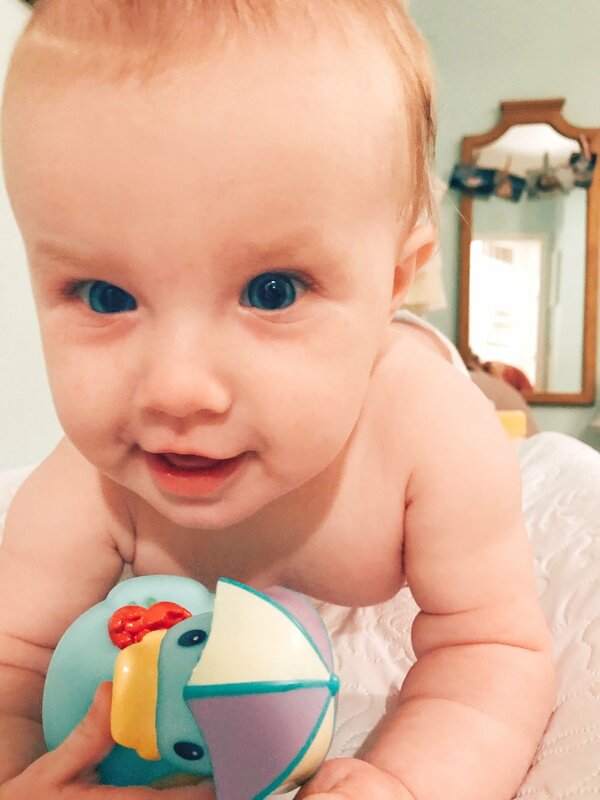 What I initially did, before seeking any professional medical advice, was soak her in an Aveeno Baby Eczema Therapy bath, every other night for a week. Immediately after, I slathered her in Eucerin and on the especially red inflamed patches, I put the purple Desitin (maximum strength). I dressed her in a full length cotton onesie that covered her toes since she had been itching her ankles. I repeated that same routine every night. It helped alleviate most of her pain and heal the really bad scratches/areas, but it still wasn’t fully going away. I ended up taking her into our pediatrician after a month of barely keeping it kind of under control. These were all recommended by pediatricians and other moms! Healing, but not fast/good enough for me! Her doctor assured me it was just a bad case of eczema and her skin not being able to heal properly because she’s very fair and sensitive to everything (heat, sweating, clothes, crawling) and I wasn’t keeping her moisturized enough. She ended up calling in a prescription (no steroids) for hydrocortisone 1% lotion. The pharmacy told me I could get it over the counter, but since this was specifically called in for her, it’s what I used. Thank goodness I did because it’s the only thing that really worked. I was also told to put it on her three times a day. So it went on during her morning nap, afternoon nap and again at night. It completely cleared her skin within a week. This is the cream she was prescribed and it cleared up so quickly!! That one leg took FOREVER to heal, but it finally did! No more red splotchy tummy! Now she does still get some patches here and there, and I have found several things that work very well and are easily accessible for intermittent rashes, as well as travel. These were also included in the top recommendations I was given for baby eczema treatment and other rashes. Several people recommended Eczema Honey (moms, nannies and nurses). I actually got to try it out and let me tell you, it’s amazing. Definitely worth the hype and the price ($29.95). I tried it myself first and felt immediate relief; it literally works wonders overnight. I wish I would’ve taken before pictures (for me & G) because it worked that well, and now you wouldn’t notice how bad it was! It works for severe cases too. If you’ve tried everything but Eczema Honey, what are you waiting for? You NEED this eczema relief cooling cream! Get $2 off each jar with my code: Amandahoney. A couple moms recommended fresh breast milk on the breakouts and to let the areas air dry. Did you know Breastmilk is viscous? That makes it a great protective layer when it dries. Breast milk by itself is an amazing antidote and can cure so many ailments including Pink Eye, acne (baby and adult), sunburn, minor cuts and eczema! It’s truly the elixir of life, especially your milk on your baby. There are specific antibodies in your breast milk that help heal your baby the best/quickest. But, if you’re like me and did not have breastmilk, another’s breastmilk will work wonders as well. I made my own breastmilk lotion with shea butter, beeswax, coconut oil, vitamin E oil, honey and lavender. There are several recipes out there with different ingredients, so choose the one that works best for you. Making the lotion is a great way to use expired breastmilk and create a paste to use several times for frequent breakouts. Another reoccurring recommendation was Tubby Todd’s All Over Ointment. I had seen Tubby Todd advertised on social media by several bloggers, but hadn’t tried it yet. They were kind enough to send me their skincare line. I received the jhair & body wash, lotion and all over ointment. I was skeptical, as I am about anything that sounds too good to be true, but again this ointment worked almost immediately. It’s right up there with Eczema Honey. I did have to use it a couple times to see the results I wanted, but it’s still an amazing product. I clean both kids with their hair & body wash and we all love it. A definite must for baby eczema relief and cleanliness! I have to admit I was surprised by this recommendation. Only one person recommended it, but she said her and her sister both used it on their kids. I was surprised because it’s not typically a baby/kid product, but a woman’s beauty product. So when I saw on their label that it worked for eczema and gentle enough for even babies, I knew I had to try it. First I tried it on myself, when it worked (and I had no side effects) after a couple nightly applications, I tried it on a couple of my daughters rough patches. And wouldn’t you know, it worked for her as well. 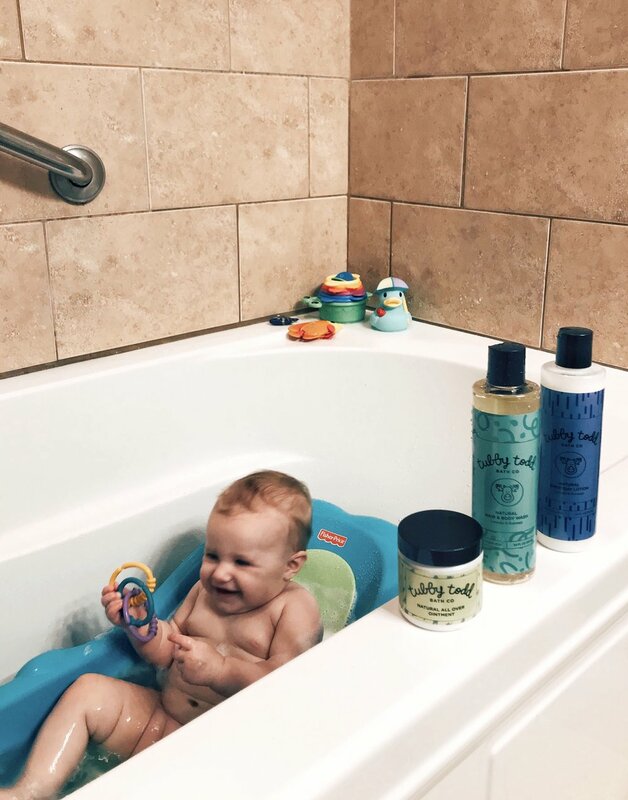 It’s not the absolute BEST eczema treatment for babies that I’ve found, but it definitely works - and everyone in the family can use it, so that’s certainly a win! I was given this to try as an “influencer” and was so glad I had it! I had never heard of this brand or any hydrocortisone cream with calendula before. Calendula is great for helping heal the skin quickly (especially cuts & scrapes!). When you’re itchy (and scratching like me), you know how important it is to have healing las soon as possible. With the added combo of hydrocortisone cream, it has a healing power I found worked better than traditional hydrocortisone cream. And I’ve tried them all! It’s not meant for children under two, but I have eczema and get plenty of bug bites!! I have used this several times on myself and it works wonders. I was pretty disappointed that Aquaphor didn’t seem to help her eczema at all. It was one of the first things the pediatrician recommended too. In fact, I don’t think it worked for either one of my kids eczema. Sometimes it helped her diaper rash and the blistering that came afterwards. It worked great as a moisturizer, but it did nothing to help heal her eczema in our case. The reason I include it in this round up, is because it is something I actually tried but did not work for us. These are some other really great suggestions that I have not tried, since I had already found several effective treatments that work for us. If my above treatments didn’t work for you, maybe you could try some of these. I put them in order by what I thought was the healthiest and effective. Apparently Young Living has a “seedlings” baby line that comes with baby lotion, oil and a diaper rash cream. Other YL oils recommended were rose ointment and soothing skin oil’s like lavender and frankincense, with a carrier oil like coconut. The good thing about Young Living oil is it’s very concentrated, so you don’t need as much and it always needs to be diluted. A bottle will last a long time. Find a rep near you! I’ve also had several people recommend lavender essential oil mixed into 100% pure shea butter. It’s safe for baby and very soothing for any skin irritation, including eczema! I included these two ingredients in my homemade breast milk lotion, and this combo definitely works! I had someone recommend this on social media and then a real life friend recommend Jojoba oil too. She is very fair and has sensitive skin just like my children and said this was the only oil, I repeat, the only oil that didn’t irritate (and make her feel greasy) mbut soothed her skin and immediately healed. You can also use it on your pets. I’m thinking I should try this one for sure, even though I already have several go-to eczema remedies. Good old fashioned, plain coconut oil works really well and won’t burn when you put it on. This person recommended Kapuluan because their company is 100% raw organic. Another brand she recommended was Skinny and Co. Her credentials? She has worked for the skincare industry for 10 years and has immediate family members that have suffered with eczema. So grateful for her suggestions! I told you calendula had healing properties before! Not surprised to see it come up again :) Earth Mama Baby Bottom Balm has it in it! This is another great balm for diaper changes, eczema rashes, and even other little bumps and red marks. It apparently takes it away so fast. This is a special formula created by a midwife specifically for babies and their skin rashes. It has really great reviews and 100% natural organic ingredients. Fresh Aloe helps to relieve the itchiness and irritation. Has a pure and simple formula with the most mild, soothing ingredients from nature for baby's delicate skin. They have a baby wash and lotion. For the cornstarch application, put in your palm and apply to the affected areas. You also might need hydrocortisone cream in those really bad/stubborn areas (or nystatin cream which is a prescription). Wash the cornstarch off daily and reapply. This suggestion comes from a nurse! You just have to dry it up and it should start to heal in a few days. A couple people recommended A&D diaper cream as a solution for baby eczema, but it did not work for us. It works on her diaper rash and blisters down there, but not in other areas. Apparently baking soda offers instant relief. You can add it in a bath or make a paste with water (or coconut oil). The paste can be a little abrasive, but takes the itch away immediately. Disclaimer: I have heard several moms say this would be too rough on baby’s skin, and I have not tried it myself, probably best to use on toddlers and adults to be safe! Dream cream was another baby eczema recommendation that I was surprised by. It is a woman’s beauty product by Lush with apparently very calming and soothing ingredients. They claim it is their most gentle cream for troubled, sensitive skin. I did check the ingredient list and there are some really great natural, soothing things as well as alcohols and stuff I can’t pronounce. They are at the bottom, so that’s good, but may not be 100% safe for babies fragile skin. Good to know for adults though! If you’re willing to spend an arm and a leg, soothe might be a good choice for treating your little ones eczema. Although, since there are so many other healthy and affordable recommendations, I would try those first! One recommendation said Shea butter and Egyptian magic cream mixed together. I’m not surprised I have another honey suggestion! Manila honey is suppose to be great for eczema. This is the only recommendation I got for goats milk! I’m kind of surprised by that, as milk baths in general are supposed to calm and soften the skin. This was a very strange recommendation, but it kind of makes sense. This girl’s doctor told her to take her child with eczema to the pool because the chlorine would help. I have taken my little one in the pool with her eczema, not because of this recommendation but because that’s where we spent a lot of time this summer, it was just my observation that it didn't work for us. But it might for you, if you want to give it a try! Here is a prevention tip! Put baby powder in the problem areas to keep it dry. Aloe baby powder would be especially great for keeping the skin soothed and cool. As you can see, there were tons of recommendations flooding my inbox and this is leaving some out! Literally every person had something different to share, only a few recommendations overlapped. There were several people who mixed oils, lotions and creams to come up with their perfect remedy. I know what worked for me and my family but hopefully you found something that can work for yours too! I would find it hard to believe that I missed any effective ways at treating baby eczema and other rashes, but if there is something different that you do, please share the love and leave a comment below!! Also, if you have tried some of these remedies and they did not work for you, please leave your experience below so others can see both sides!